Many bird species winter here at Heartland. For the past 10 years, we have followed the Audubon Society in its North American Christmas bird count. This census helps scientists follow the changing migration patterns and habitats of the birds of God's creation. The count is done annually in one day and takes about 6 hours. Bird watchers drive the roads and walk the trails of camp and its environs keeping an eye to the sky overhead. This year, 39 species and a total population of 1,009 birds were counted. Most species seen live here year round. Among them are sparrows, hawks, wrens, woodpeckers, robins, doves, crows, chickadees, blue jays, cardinals, blue birds and our special residents, the wild turkeys. Of the migrating birds, some 623 snow and blue geese and teal were counted. The most populous ground and forest winter bird is the black-eyed Junco, sometimes called the "snowbird" because of its snow-white breast. Eighty-one Juncos were counted. We missed seeing some of our regular visitors, the yellow-rumpled warblers, purple finches, brown creepers, and kinglets. Their absence may have been due to weather patterns or the gray, windy day that made it more challenging to see the birds. The large numbers of water birds in the air were looking for open water at a time when many areas were iced over. Of special interest were two bald eagles sitting on an ice floe eating their catch. We are always looking for more participants to assist in the annual count. If you have good eyes and an interest in birds, notify the camp in early December. We would value your knowledge and interest in aiding next year's count. And it is a great reason to visit this beautiful place at a different time of year. 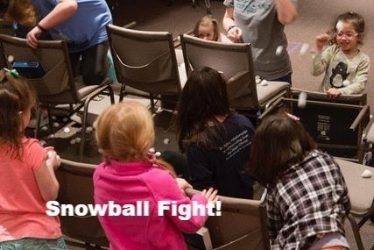 On February 19th, twenty eight youth experienced an introduction to Heartland Camp through February Free Day. Our theme was the Winter Olympics and the kids "skied", "skated", "snow-boarded" and learned about "running the race set before us." Free days let kids see what it is like to come to camp by visiting the campus and participating in fun activities. There will be four free days offered this summer. See our Website for more information. In the last 60 years, the ministry of Heartland Presbyterian Center has touched the lives of thousands of youth and adults. During that time, we have hosted over 58,000 campers and over 400,000 retreat participants. Exciting and inspiring! As part of our exciting 60th Anniversary celebration, we are looking for favorite stories of camp experiences. If you have a great memory or an "aha' moment from your time here at Heartland Center, we would like to hear about it.
" The food was so good and the staff was so nice! Thank you for all we have been able to experience at your retreat center. We appreciate you! You probably don't realize the impact you have made in so many lives this weekend by making this retreat possible. " "Thank you so much for all of your help and patience with us as we planned our retreat, and for the warm hospitality! We had a wonderful time. The meals were delicious, the rooms and facility were clean and comfortable. Thank you! God bless you in your ongoing ministry. " "Thank you for your care and attention to our needs. You were so helpful and made our stay a major contributor to the success of our retreat. The cafeteria staff was outstanding. We had such a spiritual renewal. The CLIP course provided a challenge and lots of fun." Keep in prayer these groups who will come to Heartland Center in March.